Welcome back. Permit me to begin by recalling an incident that occurred when we were living in Virginia, harboring our absent son Noah’s cat Henry. It was the time Henry leaped onto a radio on a room divider behind my chair in pursuit of a bug on the wall or ceiling. As I faced forward in the chair, the bug flew over my head. Henry followed, jumping from the radio onto the top of my head, where he prepared to launch himself into space after the bug. There’s more, of course (see Cat and Man--Henry and Me), but today, I’m bypassing Henry in favor of the flying insect. allium on living room wall. Flying insects somehow find their way into nearly every home. A few weeks ago, a wasp suddenly appeared from nowhere and made a beeline (sorry) to the canvas print of a photograph hanging on our apartment’s living room wall. 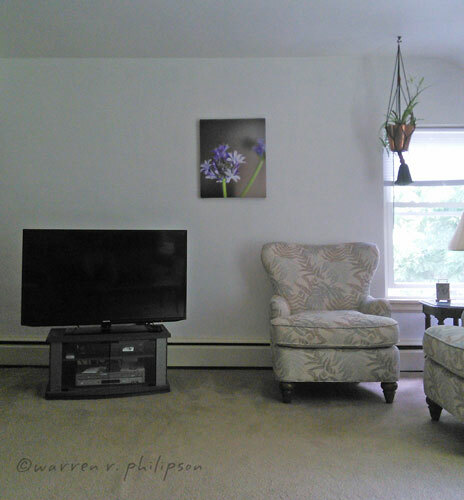 The photograph was one my daughter Rachel had taken of an allium plant against a brown wall (see Viewpoints Photo Addendum). 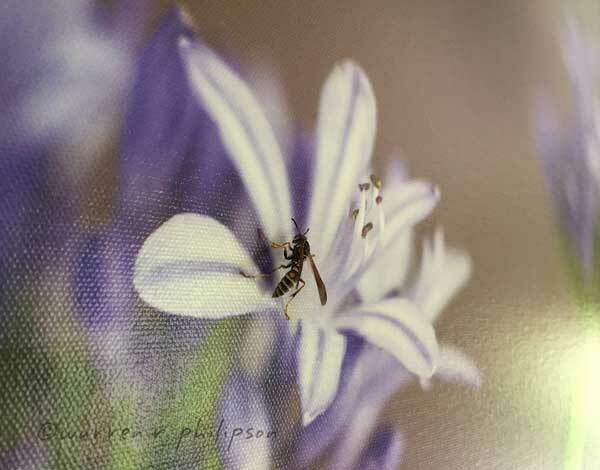 She had the photo enlarged and printed on canvas as a gift, and the wasp was carefully inspecting the image of the flower’s petals, pistil and stamen. I was fascinated to see a wasp attracted to a photograph of a flowering plant. Perhaps the poor bug was merely confused. The colors the wasp saw were likely quite different from those of the actual plant, even if the flower’s enlarged size made it an obvious target. Yet size of the flowering plant is what I had in mind having just read a recent study about bee foraging. For that study, investigators from Japan’s University of Toyama examined bumble bee (Bombus ignitus) foraging using arrays of nectar-supplying, artificial flowers of different sizes in a laboratory flight cage. It had generally been assumed that, when bees are exposed to a new area, their foraging efficiency increases as they learn the locations of greater rewards, the higher nectar providers. And that’s what the researchers observed when the test flowers were small (2 centimeters or about 0.8 inch). The bees needed time to find the next closest flower. When the flowers were large (6 cm or about 2.4 in) and more easily found, however, the bees flew from one flower to the next more quickly. They created foraging routes without accounting for the locations of higher reward flowers. The results suggest that bees choose rapid rather than accurate foraging when they can locate the flowers easily. The learning of spatial and reward information seems to be a choice that bees and possibly other foragers apply according to a cost-benefit tradeoff. If you’re wondering about the difference between wasps and bees as it relates to foraging, wasps also have high-energy needs for survival. They need key resources such as pollen and nectar from a variety of flowers, though lacking the fuzzy hairs of bees, they’re less efficient as pollinators. Now, if you’d like to run your own experiment, Rachel would be very happy to sell you a photograph or canvas print of a photograph of a flower or flowering plant. There are a few examples shown under still life on her website, www.rachelphilipson.com. Thanks for stopping by.